FYI. 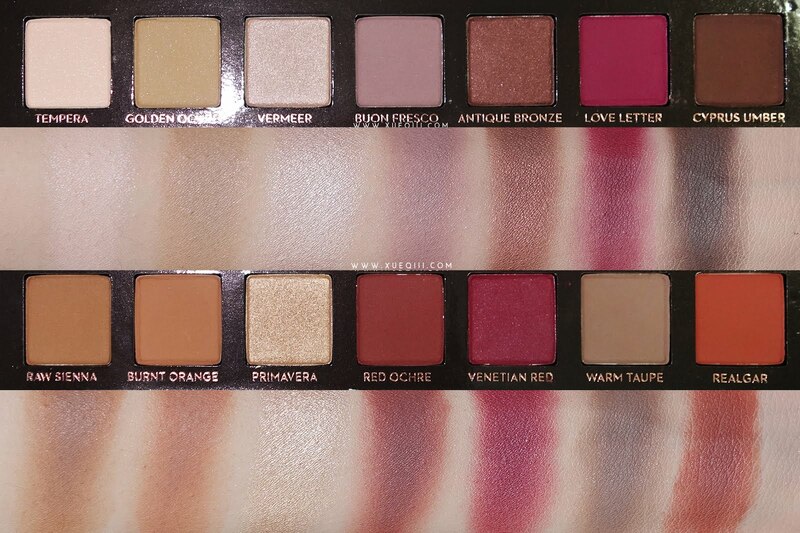 This palette has a pretty short life span. And I am honestly quite shocked at how short it was. 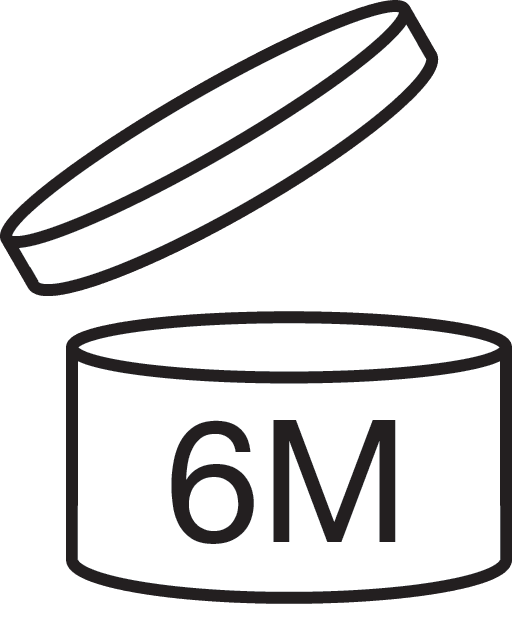 If you didn't know how to check on the expiry date of a beauty product, all products should have an icon on the back or bottom that looks like this - Period After Opening (PAO). 'M' stands for months. This palette will expire 6 months after opening. 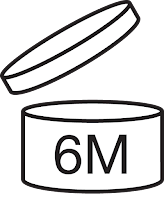 SIX MONTHS. Who ever finishes up a whole palette that fast. But to be honest, I do keep eyeshadows way past the expiry date. I'm not too particular about these as my eye lids aren't sensitive whatsoever. However you definitely should be sticking to the PAO for base products and mascaras. So back to the palette. How gorgeous! 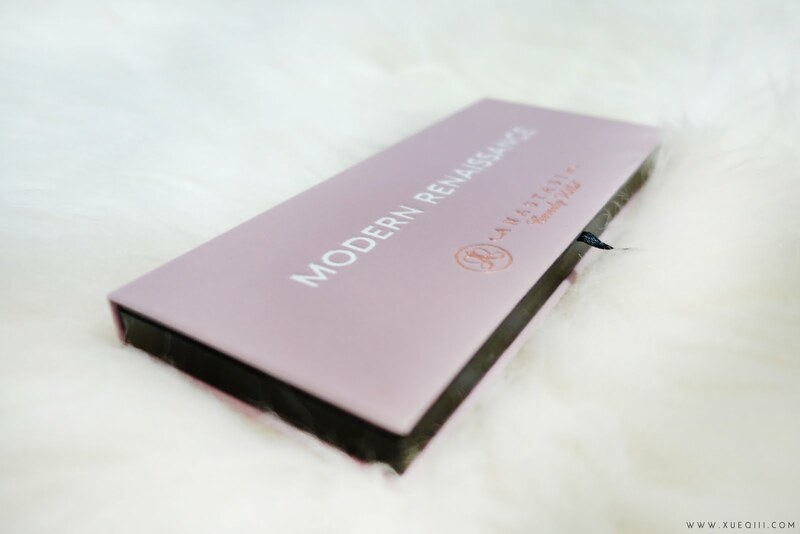 The Modern Renaissance Palette has 11 matte shades and 3 shimmery shades. It also comes with a dual-ended brush - a shader side and fluffy blending side. 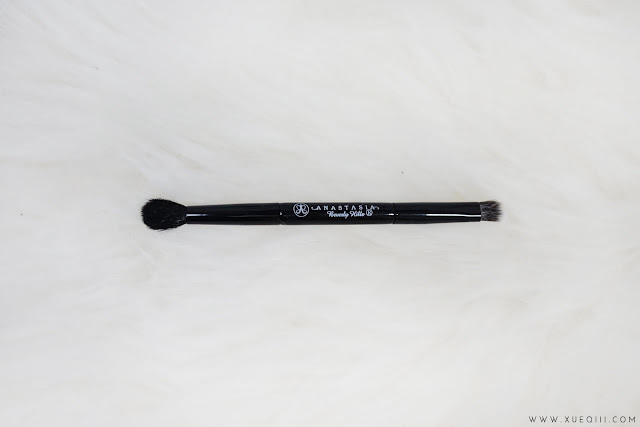 The brush is surprisingly good, its not scratchy on the eyes at all. A close up on the shadows. 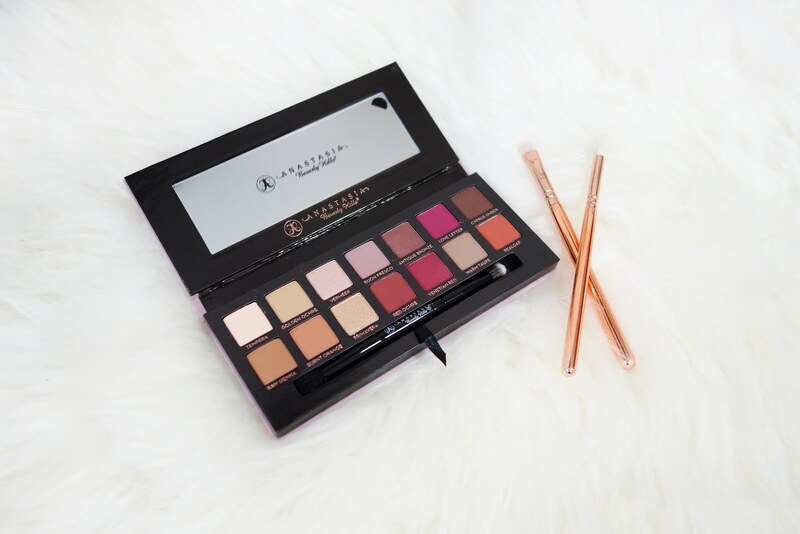 The palette has a fuzzy fury packaging. I do foresee this getting dirty but it's pretty nonetheless. Tempera is a matte cream beige. Golden Ochre is a matte earthy yellow. A poopy brown. Vermeer is a shimmery iridescent light pink. 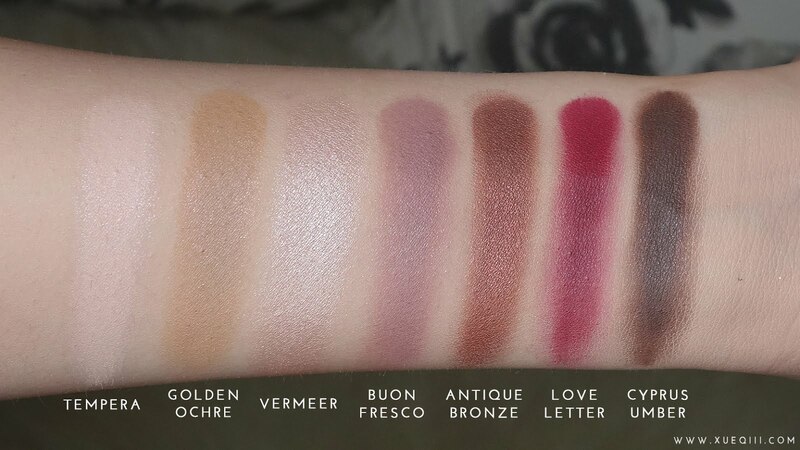 Buon Fresco is a matte dusty lavender. Antique Bronze is a burgundy toned chocolate brown with a cranberry shimmer. Love Letter is a matte raspberry. Cyprus Umber is a matte dark chocolate brown. Raw Sienna is a matte neutral sand brown. Burnt Orange is a matte warm orange. Red Ochre is a matte deep brick red. Venetian Red is matte rich cranberry. Warm Taupe is a matte earthy grey. Realgar is a matte burnt orange. 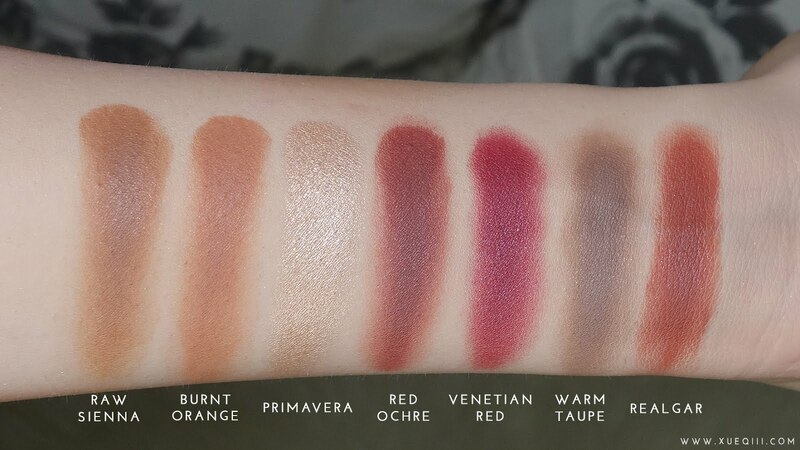 I didn't have great lighting as it was raining so these swatches were taken under my ring light. 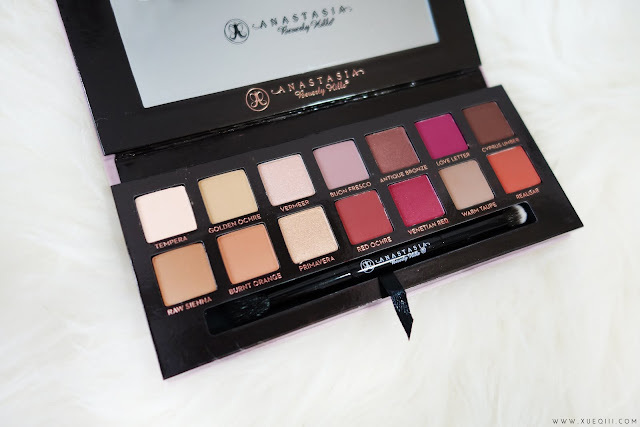 This is my first Anastasia product, aside from their brow pomade. I'm still not too sure if I love this palette yet. The shadows do kick up a lot of powder when you dip your brush in, so it is important to tap off the excess. 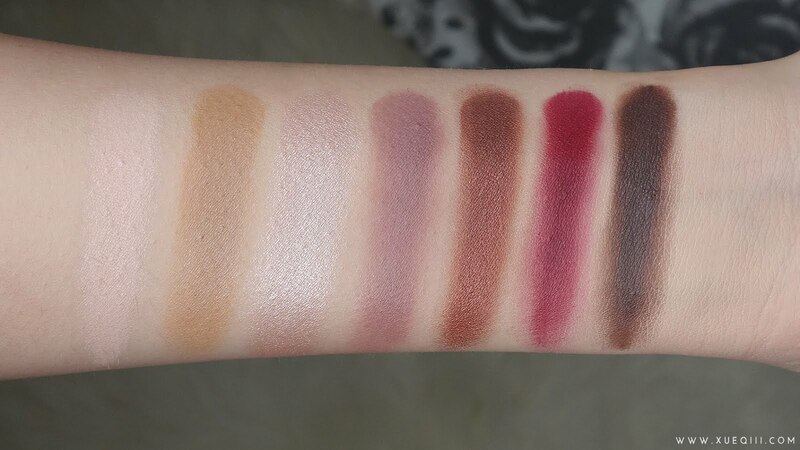 I'm not mad about it as the shadows are very soft and pigmented, and it blends out super well. 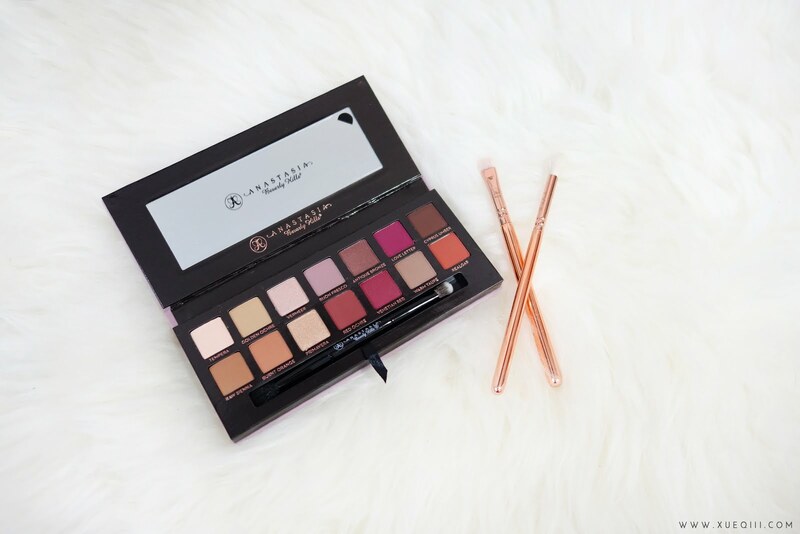 The shimmery shades are pretty for daily looks as it is not too metallic - you can always wet your brush for a more intense finish. Personally, I prefer a more metallic finish so this is the only thing that I'm not too excited about. I think I will be keeping this palette although it has very similar shades as the Violet Voss Holy Grail Palette that I reviewed not too long ago. 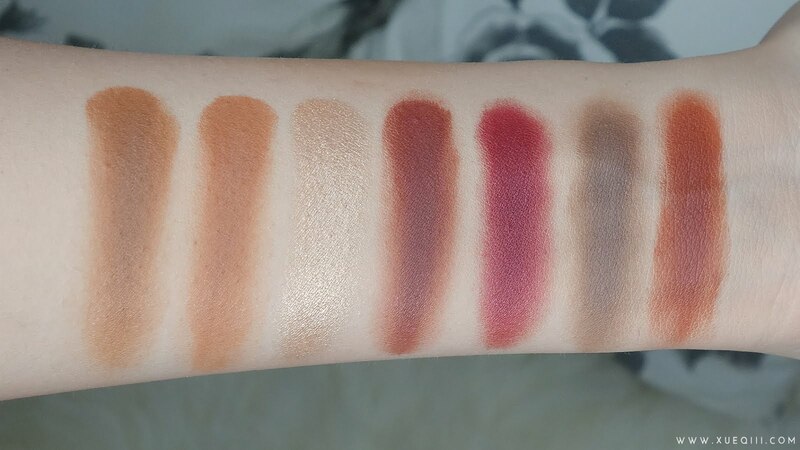 The quality of these shadows exceeded my expectations despite the messiness. 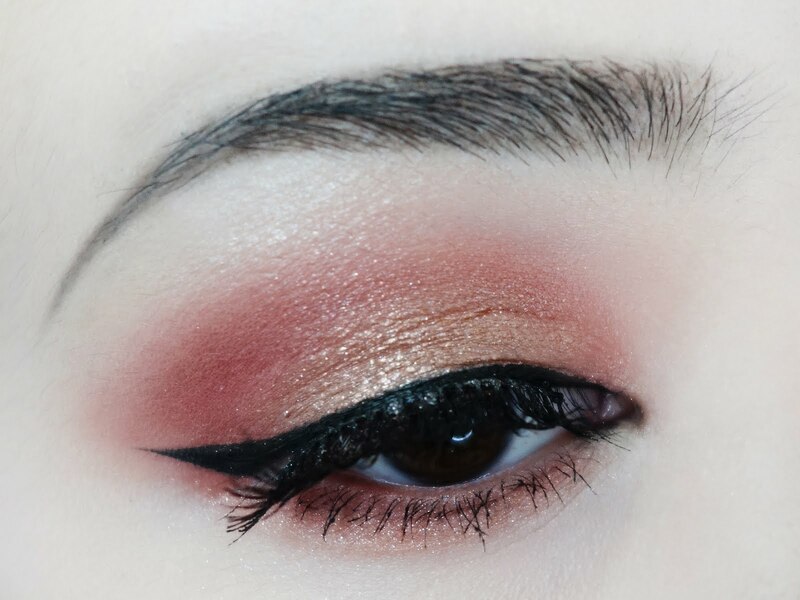 Do not be afraid of the red shades as you still can still achieve simple everyday eye looks with this palette. If you are a fan of warm tones and reds, this will be a perfect one for you. I will be definitely be playing around with this palette. Keep your eyes peeled for eye looks soon! thanks for the link the beauty bay! Thanks Agnes :) glad that you liked the post.